Yet recent numbers did not align fully with this predictions. 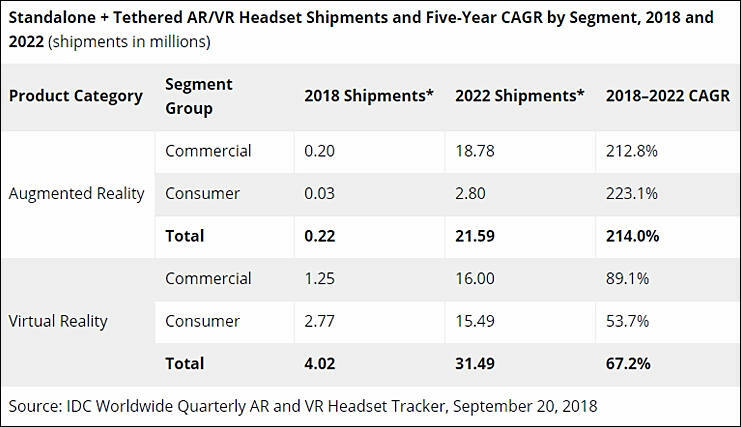 These marketing gurus are clueless when it comes to mass VR/AR- the accuracy of their past predictions should be posted before allowing future projections. Would you listen to a weatherman or financial advisor who is 90% wrong? I have a tip for the clueless morons- watch AUTODESK. The day you see Autodesk AutoCAD 2D drawing and 3D software sales plummet due to VR/AR software/hardware completely replacing traditional drawings/blueprints, that's the tipping point. Engineers & Manufacturing have been the TARGET audience of VR/AR and 3D Printing for over 3 Decades now (no joke), and have to solve REALWORLD problems with assembly, manufacture and design HOURLY/DAILY! all the CAD terminals go away and are replaced by VR suites in bright office suites with windows for use 24/7 and KEY factor: NO side-effects for the engineers health or vision, the technology will finally be ready to take off for mass consumption. Other than the few lucky CEO who sold off early, developers and the rare committed individuals who spent way too much money on a promised experience and future content that didn't pan out, it is arguably in a worse state than 3D was. I do hope glasses-free 3D TV via 8K 120Hz panels develops a new resurgence, as the combination of HDR, High resolution and High Frame Rate can finally deliver a pleasurable real experience with minimal discomfort for everyone. VR/AR is nowhere near the refinement of 3D TV at this stage with manufacturer and consumer buy-in, and while each consumer gets burned by one of the above points at each stage, the developers/manufacturers need to get a serious scientific approach for helping engineers/manufacturers/doctors and assisting impaired individuals first overcome real-world challenges daily to work out all the kinks before turning it onto mass-consumers. If you think I am off-track, Nvidia just a month ago launched their latest high-end graphic cards with barely a mention of any serious new improvement in VR/AR, and that's one of their supposedly core businesses! Idea to move Autodesk CAD to VR is utterly stupid, can tell you as guy who actually worked for long with such and know people who work constantly. Idea to move some of solid modeling apps to VR can be good, but some and it comes with HUGE number of issues. Due to eyes physics people CAN'T use VR or AR for any prolonged time without bad effects. No actual product exist or are even planned to solve this. Killing of 3D market happened during private meetings of big guys. One of the key point had been that you could not rise actual margins on 3D homes movies (as was planned), but production costs rose. Next bad thing is that 3D is now views by banks as key factor to set cinema from home viewing. Hence it had been required to kill 3D sets market.